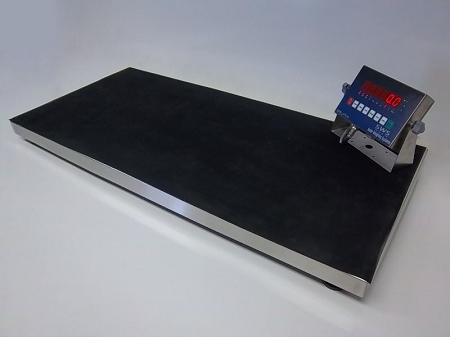 The Scale Weighing Systems SWS-7623DVS-LED, Digital Veterinary Scale is a low profile veterinary scale with large platform, 43" Wide x 20" Deep x 2.5" High, with a removable heavy-duty mat that helps keep animals from slipping on the weighing platform. The low profile makes it easier to get a patient on the weighing platform with ease (no lifting required). With a Standard capacity of 800 lb x 0.2 lb / 400 kg x .1 kg, the 7623DVS will accomodate most animals. The SWS-7623DVS features an Easy-to-read 1" LED display with auto-zero, auto-tare, auto-reweigh, and Weight Hold feature. Remote electronic control console with Wall & Desk mount Bracket included. The 7623DVS is AC/DC and the Rechargeable battery ( aprox. 100 hrs )and 120V AC Adapter/Recharger are included. 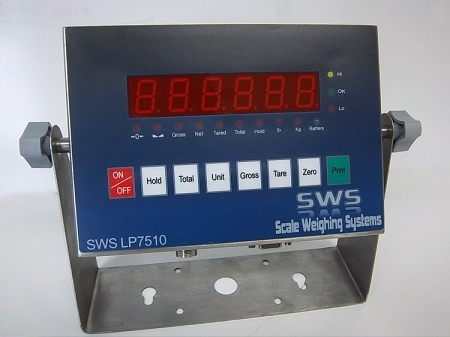 The SWS-7623DVS-LED Veterinary Scale Indicator is completely Stainless Steel ( NOT PAINTED STEEL, NOT PLASTIC) and the base is mild steel with a Stainless Steel Cover to ensure your scale looks as good in 10 years as the day it was put into service! Connected to the platform with a 20` Steel Braided Cable allows the Display to be positioned away from the base without the worry of those pesky rodents chewing the cable. The SWS-7623DVS-LED's maximum capacity of 800 pounds assures veterinarian practitioners it will accommodate both animals that are large and small safely and accurately. Motion sensing technology and lock-in weight feature gives you accurate weighing results even if the animal is moving during the weighing process. An optional telescoping display stand ( pictured below ) is available and is adjustable from 39" - 60 " high.